It's been four years since I published my first novel, Uprooted, and almost exactly 3 years since I last wrote in this space. That's not to say I haven't been busy plotting out my stories, or even writing substantial copy. For a quick update, let me say that I have the sequel to Uprooted 90% outlined and I've written the first 3 scenes. I also have a Civil Air Patrol story (historical fiction, set in the '80s) 90% written, just not quite ready to release. I've outlined various other stories in the Orinthia series, some sci-fi, and even some 19th Century historical fiction based on my story Fire Warms the Northern Lands, about the Prussian royal family. But today I want to highlight the work I've done on a story tentatively titled The Lifter. 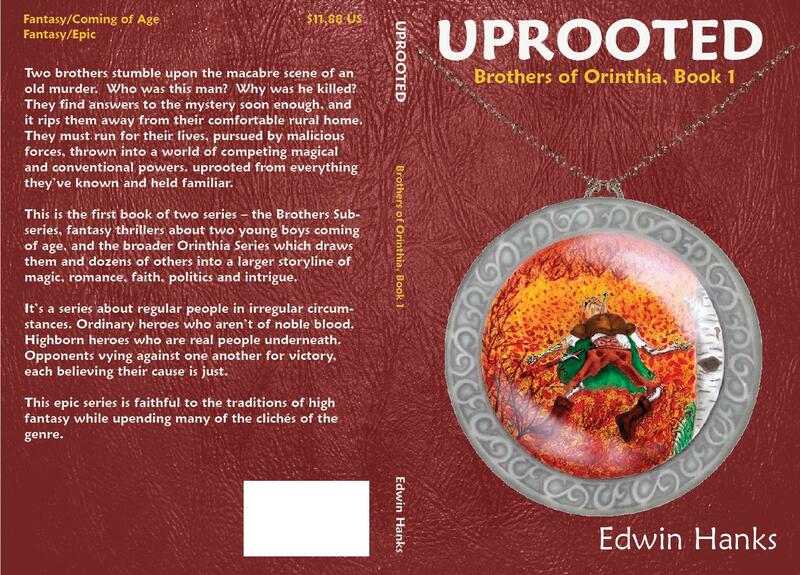 It will be part of the Orinthia series, but set in the 2nd Age (Uprooted is set in the 3rd Age), when humans suffered under varying degrees of subjugation in a world run by the Strongmages. In my Orinthia stories I've made a big deal of "genre twisting" or tilting against convention. For instance, the heroes in Uprooted don't have any special powers -- they're just normal young men (children?) who aren't heirs to any fortune or prophecy, trying to survive in a complex world which seems to want to kill them. The Lifter is a genre twister of sorts. On one level it's a more solid introduction to the world of Orinthia than Uprooted. It's set in the legendary city of Therfilamon (later called Selinda, in the 3rd Age). The book will describe the gloriously dramatic capital of the Pelarch (noted in Uprooted as "Arch Protector Against the Armies of the Sea"). The Pelarchate consists of a large human subcaste which exists under the ruling class of Strongmages and Lesser Mages. Revolution is afoot - unrest and turmoil, as the restive human population desires freedom. But against this backdrop an inspector must unfurl the story behind a series of high profile heists. The Lifter is perhaps 50% outlined, and I'll be doing some writing in the near future. There's a better than even chance that The Lifter may be published before the sequel to Uprooted. Not to worry -- there will be compelling characters in each. Some of them may even be in both novels! I’ve always been a fan of history. Even before I read my first novel, as a young child, I was studying world history out of a sample “A” volume of the World Book Encyclopedia my family owned. The more I learned about history, the more I realized how awesomely big it was. Even if I learned the places and dates of World War II battles, there were always smaller stories that went on in the midst of those battles. Dogfights, individual cruisers (and their crews), small units of a dozen men cut off behind the lines. And even if I were able to learn “all about” the 20th Century, there was still the 19th Century, and the 3rdCentury before Christ. It quickly became obvious that I would never know all of history – it was too big. And that fascinated me. You could “see” the rudiments of history with the naked eye, but if you grabbed a magnifying glass and looked closer, there was always more history. Like a fractal. A fiction story generally exists within the magnifying glass. You don’t read stories about galactic battles or tribal migrations without being zoomed in. It wouldn’t be interesting. I think this is the prime reason why students consider history boring – they don’t have a connection with the “story” of history through real stories. And that’s why fiction novels have to be real stories, not collections of facts. Herman Wouk’s epic Winds of War wasn’t about “World War II” so much as it was about the lives of individuals whose own stories told the bigger story. The other thing that fascinates me, now, as an author, is how fiction stories are often more interesting if they’re set in a fictional world that mimics the size and awesomeness of history. J.R.R. Tolkien developed maps, histories, poetry, even fake languages for The Lord of the Rings. Some stories can exist within a very small “world.” The story doesn’t require a larger context, and might even be distracting if they had one. A story about a New York businesswoman and her travails at work may not need to connect to a world anywhere outside of her high-rise. Maybe just someone on the phone in London. But that colleague in London might as well be in Helsinki or Kalamazoo, unless the story requires dialogue about fish & chips or some pseudo-historical event to be going on in the background. Your mystery readers may or may not need to know that your murder victim marched at Selma. But if your villain was also involved in the JFK assassination you’ll have to provide historical context, perhaps including matters related to the Cold War, race relations or rock & roll. Otherwise your story will lack immersion. Literary genres require “worlds” less than science fiction, fantasy or historical fiction. And historical fiction, unless it’s “alternative,” already has its world written. Fantasy and sci-fi need their worlds to be imagined anew – a process called worldbuilding. If your hero is a “Wozan Warrior,” you need to know what that means. Who are the Wozan, and why are they at war, and with whom? A planning map of Orinthia showing tribal migrations. If, instead, your hero is abducted from his living room by spies of the Zilgan Space Empire, you’ll need to understand a lot about their history in order to write a believable, immersive story. Authors often need a world – real or imagined – to work from. Such a context, even if it’s not directly relevant to the story, allows you to create richer, deeper, more empathetic characters and plotlines. The process of worldbuilding deserves a whole article of its own, and when I do that I’ll link it here. But in general your world needs to be scalable. Your world needs to be big enough that when your readers wonder about the big picture, or when you’re trying to provide significant details, there’s something to see with either the naked eye or the magnifying glass. Important leaders – who “matters” in this society? For the most major of those groups, what do they believe and how does it impact the world? Societal tensions – who hates who, who protects who, and why? 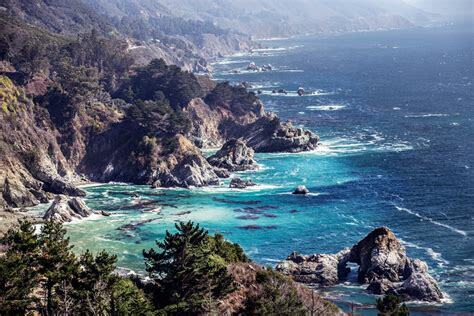 Geography – Knowing the lay of the land helps, literally and figuratively, but additionally what land/water features make places special? What special magic or technology is important for the story – what makes it work? What dependencies does the culture have? Are there potentially shortages which could cause problems? There’s more. There’s always more. And that’s half the fun! One thing to remember is everything is connected. If a city is in the middle of the desert, it has to have a source of water or food. Wells? A river? Magical food delivery/creation? If either isn’t there, then the city will rely upon merchants to haul stuff in. That means it’s vulnerable to a siege (IF the siege force has a supply source too). If your space empire needs a lot of FTL starships, and they require a special fuel, in a real universe that fuel would have to come from somewhere. Many stories finesse this and assume the source of supply is secure. But it can become an important plot device if you need dilithium crystals, say, and there’s only one planet nearby where you can find a replacement for your shattered drive system. The good news is you don’t have to provide every detail. Just the ones that matter. It matters more the bigger and more epic your story is. A series of books set in a world of high fantasy probably is going to require a pretty detailed worldbuilding project. Still, you can get away with a “design-build” concept – develop as you write – if you’re careful. 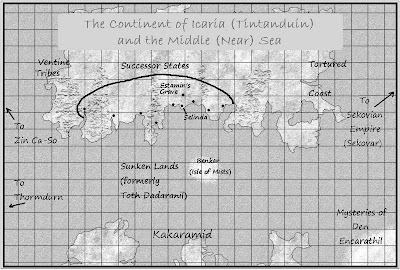 Take my epic fantasy universe, for instance – the World of Orinthia. 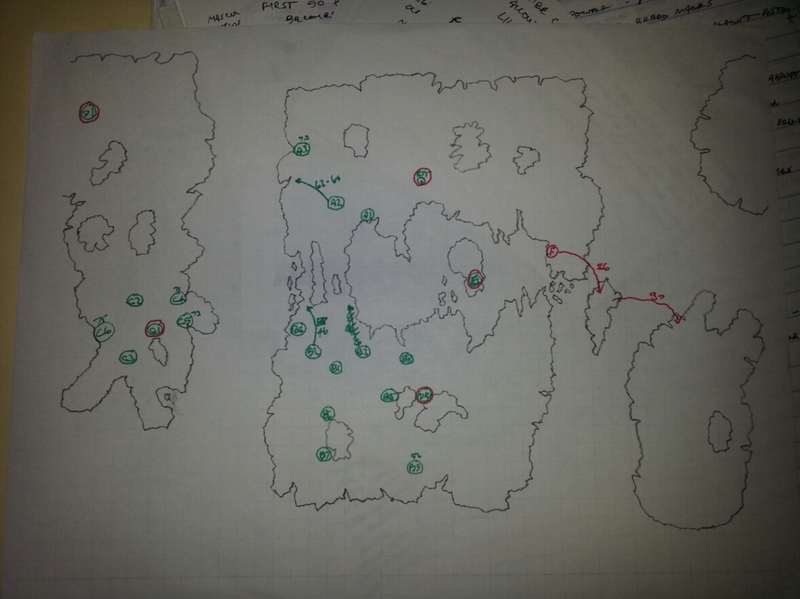 I started developing the world I’m using all the way back in 1998. A lot has changed since then, which required careful attention to keep things from going awry. When I decided to turn it into a novel series I had to do both, writing and worldbuilding. I can tell you the worldbuilding is nowhere near done. I haven’t fleshed out everything for books 12 and 15, for instance, because they will dwell upon cultures I haven’t had to tell much about in my first book, Uprooted. But Uprooted did mention a lot of the background for my world, and the worldbuilding for those details had to be at least partially fleshed out before I could write sensibly about them. I am presently devoting many hours to building my world out further before writing books 2 or 3 or 4. Why? Because without a good framework to draw from you run the risk of “continuity errors.” If I mention the Zoolies in book one, and tell something specific about them, I cannot easily go back in book 3 or 4 and contradict that point. So the more you write, the more you lock yourself in. That’s okay to a point, but a pilot would call that “flying by the seat of your pants.” It’s risky, because you may accidentally paint yourself into a corner, or even introduce a major contradiction that will make you have to change your whole plot arc from what you intended. The safe practice is to build what you need, and then build a little further. Keep building as you keep writing so that you, the author, are always more sure of your world and the material you have to work with than your reader ever needs to be. I read three blog posts this morning that got me thinking. Two were from Christopher Rice (one and two) about when gaming campaigns (RPGs) develop to the point they're a fantasy world unto themselves, not just hack & slash adventures. The other, by Peter Dell'Orto (here) was a response to Chris' idea, and about how to prevent your campaigns from developing. Together, they were a fascinating look into the differences within fantasy gaming. At first I thought, "Who wouldn't want to allow their fantasy world to expand into its own world?" Then with a shock I realized I have two fantasy fiction series lined up, and between them I cover both philosophies. A couple weeks ago I described to a good friend and fan how I see the Orinthia series developing. I forsee it as kind of like a pinwheel. 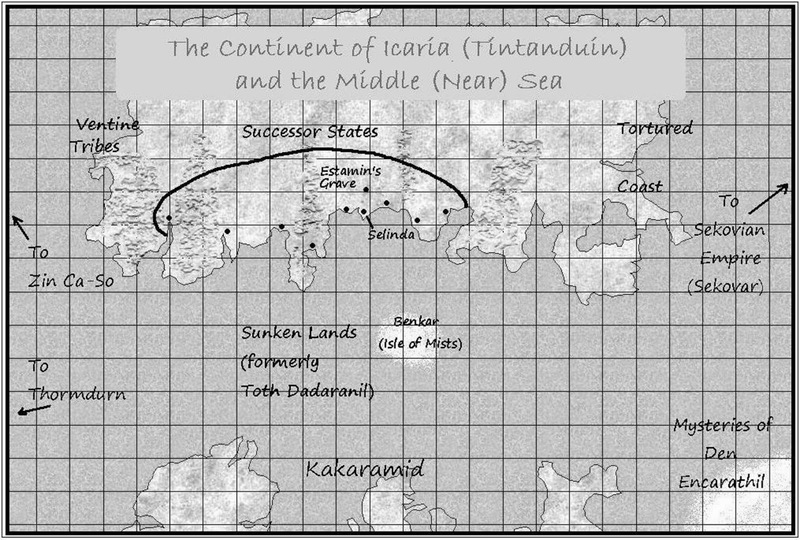 I'm writing about the complex ultra-realistic (for fantasy) world called Orinthia. I am using miniseries of trilogies or individual volumes to connect together and interrelate with the others to form a coherent whole. There's a tall stalk in two shades. I expect to write 3 to 5 novels describing the First Age of ancient history. A few weeks ago, while building out the deep background for all these stories, I outlined and partially wrote the first 3 of these novels. And I'll write another 6 to 8 novels about the turmoil that ended the Second Age, when powerful mages ruled the world and then got overthrown. Some of these novels are outlined and partly written already, also. The culmination of my fantasy epic will be in the Third Age, when many factions vie for power and it's not entirely clear who might come out on top. Here, several miniseries will follow the lives of sets of characters and, like the spokes of a pinwheel, will all merge at the center into a convergent storyline. Sound like a big project? It is! I actually began building this world in the summer of 1998 (some of you might not even have been born yet!). 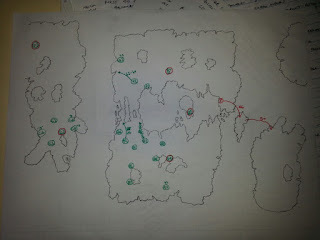 I ran it as a homebrew RPG system for some friends, but didn't get far. I resurrected it when I wanted to start writing fantasy novels. I return to old projects frequently, and I have a good head of steam built up for this one, so I'm sure this one will turn out well. 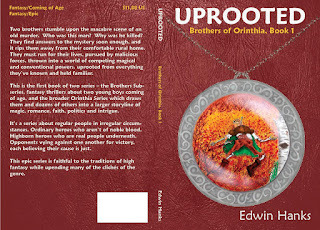 I've already published the first novel set on Orinthia - Uprooted, available from Amazon.com in Kindle or paperback forms. This first book introduces two young boys - teenage brothers - who stumble upon a murder that involves them in a plot of interfactional intrigue. 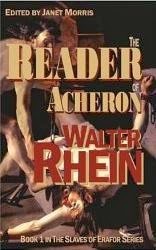 The murderers want to kill them, but they're not the only ones, and they're given a necessary lesson in the history of Orinthia, and its geopolitics and philosophies, religious or otherwise. The Brothers of Orinthia series only provides hints and glimpses at the world around the boys. But you can quickly tell that there's a well-developed backstory behind everything. And I can tell you I'm still working to flesh out more. I feel like I need to have it mostly developed so that I can do as I did in my first book - include more hints and partial solutions to questions, more tidbits of mysteries to be resolved later. To see the rest, there will be more books, more series, some from the same time period, and others from different periods. I dare to believe that it might someday be as involved as the Game of Thrones or Wheel of Time series. But back to Peter's thought. Why would someone want their story to NOT develop?? I went through a phase, after beginning to write the Orinthia series, where I yearned for simpler things. Fantasy environments that were fun and involving, but didn't require a lot of thought. Just enjoy. I started reading Dungeons & Dragons novels, other related "gaming" fiction, started playing Icewind Dale for hours at a time. Eventually, finding not enough fiction easily available, I decided it would be fun to write a simpler RPG style series of books. Thus was born Nighland Key and his band of adventurers! I've begun writing this series, and planning, and developing the characters. It's fun, but it's not done. More Orinthia ahead before these will be available. But they're enjoyable to write, and I would presume they could be written more quickly, so you might see them in the not too distant future. So, I realized, I'd mirrored in my own writing the dichotomy between these seemingly irreconcilable points of view on worldbuilding. Sometimes you just want something simpler to read, or play, or write. Thanks for reading! Now I'm returning to writing the Orinthia series. As always, I'll encourage you to please pick up Uprooted and leave a review on Amazon. Reviews provide life for authors like myself, and will generate more sales. 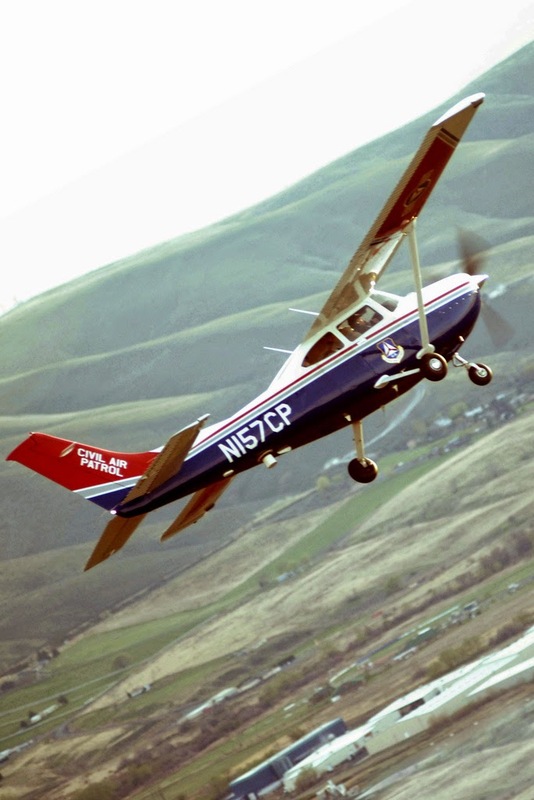 I'm proud of many things I've done in life but probably the most significant and impactful experiences when I was young revolved around my 8 years in the Civil Air Patrol. When asked I used to tell people Civil Air Patrol (aka CAP) was sort of like Air Force Scouts (like the Boy or Girl Scouts), though that was a gross oversimplification. CAP is for young people 13 and up (or graduation from 6th Grade if below age 13), but also for adults. Though not a military service (it's a civilian auxiliary of the Air Force) during World War II and since CAP patrolled the coasts and even dropped bombs on German submarines. My specialty, once I'd tried out a number of the many options open to cadets (the young folks - 13 to 18 or up to 21 if desired), was emergency services. In practical terms that means search & rescue (SAR) or SAR support. That's what Civil Air Patrol Stories is about. The first story I'm going to publish is merely an introduction, and it's short (not novel length - more of a novelette), but it will give readers a feel for what's ahead for the series. It's about a search & rescue mission - roughly based on an actual mission - set in 1988 when the main characters are in high school. You get an idea of the kind of drama and excitement is to come. The second story will be novel length and provides an introduction to the squadron, more of the characters at an earlier age, and provides a look at the wide range of activities and roles CAP cadets can participate in. It shows why I had such a blast even at age 13. To keep tabs on these upcoming stories and to learn more about when they'll be available (soon! - in paperback and Kindle formats) please LIKE me on Facebook and/or follow me on Twitter . Why do I keep posting about the similarities between fiction writing and cooking? I really think there's alot to be said for the analogies. The more I write, the more parallels I see. My wife will tell you (she tells me, anyway) I'm a pretty good cook. She's amazed that I can season without measuring, and can take 3 regular recipes and combine them into one allergy-free dish that tastes good. She'll also tell you I'm very impatient in the kitchen. Which makes breadmaking a chancy, frustrating process for me. You just can't rush good bread! I put the dough together - regular mixing stuff, done that - then add these little pellet-grains of activated yeast. For about 3 minutes. Or maybe 5. And then I start to get this yawning fear that something isn't right - that maybe I did something wrong. Ten minutes in, I'm trying to figure out what I might do to correct my presumed mistake. Soon, I might be acting on that presumption, and probably short-circuiting the whole rising process! Yes, it's true. I've been telling people my first fantasy story - Uprooted - is "almost" done for about four months now. In truth, the story has been "almost done" for four months. It's just I was never satisfied with the result. I kept thinking I'd be disappointed with myself if I published it in that shape. I keep wanting it to be more compelling. More interesting. More tense. I want the characters to be more meaningful to the reader. I want the story to be more suggestive of a wider world and more stories ahead. So I've been working on it. Alot. Gradually it's been taking shape. It's been "rising." It's been taking on a shape entirely unlike what I imagined I was writing, when I first set out. Not long ago, I was planning to publish a story that was 17,000 words long. Recently I sent out a story that's 33,000 words long to a set of trusted beta-readers. And while they're working on reading and providing critiques, I'm changing it yet again (in relatively small, but meaningful, ways). It's growing, and filling the "pan." I've grown wary and tired of using the phrase, "It's almost ready to publish." So I won't say it again. I may never use that phrase in the future! But the fact that the "rising" has slowed, and the fact that my beta-readers are reading and sending back final comments, should give you an idea that this first story set in the world of Orinthia will be ready relatively soon. I keep comfort in the idea that alot of the depth and background I've developed for this introductory story will be very helpful for me as I expand the series and add more novels. Hopefully, those will be easier and quicker to write!